Lagos State Governor, Mr. Akinwunmi Ambode (right); member, Lagos State House of Assembly, Lagos Island II Constituency, Hon. Sola Giwa (right); Special Adviser to the Governor, Central Business District, Prince Anofiu Elegushi (4th right); another member of the Assembly, Hon. Nurudeen Solaja-Saka (4th left); Chief Press Secretary to the Governor, Mr. Habib Aruna (3rd left); Commissioner for Tourism, Arts and Culture, Mr. Steve Ayorinde (left) and others during the One Lagos Fiesta Grand Finale at the Eko Atlantic City, Victoria Island, on Tuesday, January 1, 2019. Lagos State Governor, Mr. Akinwunmi Ambode (2nd right); Attorney General and commissioner for Justice, Mr. Adeniji Kazeem (right); Special Adviser to the Governor, Central Business District, Prince Anofiu Elegushi (2nd right); member, Lagos State House of Assembly, Hon. Nurudeen Solaja-Saka (left) during the One Lagos Fiesta Grand Finale at the Eko Atlantic City, Victoria Island, on Tuesday, January 1, 2019. Lagos State Governor, Mr. Akinwunmi Ambode on Tuesday assured Lagosians that the Government would deliver more life changing projects in 2019 for the greater benefit of all residents. 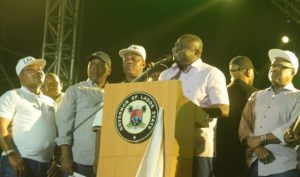 Governor Ambode, who spoke in his New Year message to Lagosians at the grand finale of the 2018 One Lagos Fiesta (OLF) held at the Eko Atlantic City in Victoria Island, said though 2018 was a great year for the State, the New Year holds greater promises for all. On expectations for Lagos, Governor Ambode said irrespective of the fact that 2019 is an election year, the State would witness more prosperity as the enabling environment for the economy to thrive had already been firmly established. “I want you to know that 2019 has a lot in stock for all of us and we must stand up for a better Nigeria and a greater Lagos. “I believe the GDP of Lagos will grow and I believe irrespective of what is happening, Lagos remains the most prosperous State in Nigeria and it can only get better,” the Governor said. The Governor attributed the successes his administration has recorded in the last few years to the sterling efforts of security agencies in keeping the city safe, adding that the State has emerged as the safest place to live in Africa. He also assured that he would leave no stone unturned to ensure that ongoing capital projects across the State would be completed before the expiration of his tenure in May. “The modest successes we have recorded would not have been possible without the efforts of security agencies in the State. “I want to appreciate the efforts of security agencies for their dogged contribution in making our State the safest place to live in the country and Africa right now. “Let me also assure residents that we are committed to their well-being, security and safety. We also want to assure that we are committed to completing all on-going projects before the end of May,” the Governor said. The Governor said he was thrilled that the OLF was meeting the set objectives, saying that the positive impact of the fiesta on the economy of the State had been massive and encouraging. “The positive economic impact of the fiesta is very visible. You see, at the beginning, we were doing this particular fiesta in just one location but again we have been able to increase it to five locations, eight days, 40 concerts and you can imagine everything surrounding it in terms of employment, job opportunities for food hawkers, artisans and above all, the security that has kept the city very safe. Besides, Governor Ambode also seized the occasion to urge Lagosians to go all out and vote enmasse for President Muhammadu Buhari in the February 16 presidential election and also for the All Progressives Congress (APC) governorship candidate in the State, Mr. Babajide Sanwo-Olu in the March 2 election. According to him, victory for both and all other candidates of the party would continue the positive economic trajectory the country and the State in particular has witnessed since 2015. “It is the best interest of all of us to re-elect President Muhammadu Buhari and we assure the President that we would deliver Lagos for him come 2019. “In Lagos, we must continue with the plan that has worked and vote Mr. Babajide Sanwo-Olu as the next Governor of Lagos State,” he said. The 2018 OLF with the theme, ‘A December To Remember’, continued in its fine tradition of holding simultaneously in five locations including Agege, Badagry, Ikorodu, Lagos Island and Epe just as it attracted thousands of participants and millions of viewers across the world. The highlight of the grand finale at the Eko Atlantic City venue was the spectacular display of fireworks and the raffle draw which saw Mr. Ayodeji Omoboye, a resident in Ikorodu emerge winner of a brand new car from GAC Motors, while other residents went home with consolation prizes.